Today, I have an up and coming author on my blog sharing about her new project. I first got to know A. C. Dillon through her online writing and fell in love with her writing style. I'm excited to see what she is working on next and was thrilled when she offered to write a guest post on my blog. Please give a warm welcome to A. C. Dillon. Once upon a time, in a land north of the 49th Parallel, there was a writer. This writer, on a foolish whim, decided to take on a new challenge: writing a screenplay. For the record: Script Frenzy is a seductive siren to a writer with an itchy set of typing fingers. The premise of the script was simple: a series of vignettes, surrounding a sad day in the life of the protagonist, Autumn Brody. Through monologues and funeral preparations, it was to be a commentary on life and death, mental illness and love. Originally, I envisioned it as a short film, although I did see potential for a full-length feature in the premise. I sat down to work with enthusiasm, Celtx loaded onto the laptop, and set off on a new adventure in creative writing. I got about five pages into it, and abandoned all hope of ever writing a screenplay. It wasn’t the story that thwarted me; as usual, all of my plot bunnies were in a row. It wasn’t the translation of words to images that baffled me; my writing always begins with a sudden, sped-up movie of the entire plot bursting into my skull, after which I replay it, capturing it with metaphor and mad doses of caffeine. It was the formatting itself: it was too jarring, too tedious to set it all up. I wanted to type a novella into the scripting program, and have it magically convert it to lighting cues, set scenes, and annotated dialogue. For me, a story is about flow: I can’t write when things feel forced or unnatural as I put proverbial pen to paper. The stop-start of scripting was, for me, ruining the ability for the characters to tell me their secrets. 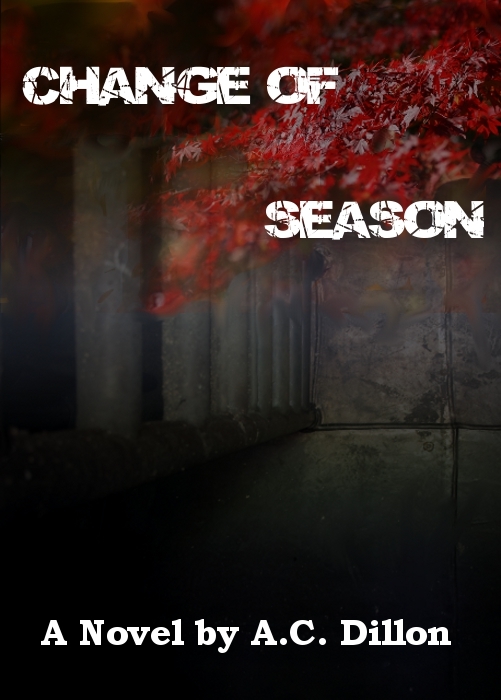 Change Of Season 1.0 was promptly shelved, as a result. Nearly two years later, I was smacked with a new vision… and within it, I recognized the shy redhead scampering through a forested campus. It was Autumn: younger, more fragile, but still struggling with the demons she’d revealed before in her twenty-seven year-old version. Only now, there were more problems, things far more terrifying than the death of a friend. More importantly, there was a story to weave the abandoned characters together. The plot bunnies had gone wild, and I was now a willing slave to their proliferating offspring. At the epicentre of the spectral storm is Autumn Brody, locked in a personal struggle for survival and sanity as she is haunted by the past and hunted in the present. The world she is trying desperately to outrun is about to collide with the precarious new world she’s forged, shattering everything she thought to be true and putting the lives of those she loves on the line once again. The ghosts lingering in the Ashbury Hall dormitory will not be silenced any longer. They want blood, and only Autumn can help them quench their thirst. But can she bear the weight of their demands and exact justice for them as her mind unravels, or will she become another victim of the Casteel Curse? For updates on the novel’s progress, insights into the writing process, teasers and publication information, please visit http://autumnbrody.wordpress.com. Thank you A. C. Dillon for sharing. I have just one question: Can I review this book when you're finished?